Credit is an arrangement whereby bank acting at the request and on the instructions of a customer or on its own behalf to make a payment to or to the order of a third party or is to accept and pay bills of exchange drawn by the beneficiary. In an economy banks play the role of an intermediary that channels resources from the surplus group to the deficit group. So obviously one of the core functions of Commercial banks is to sanction Credit facility to its customers as per requirement. UTTARA BANK LTD. Bank’s Mission is to actively participate in the growth and expansion of our national economy by providing Credit to variable customers in most efficient way of delivery and at a competitive price. Risk is inherent in all aspects of a commercial operation; however for Banks and financial institutions, credit risk is an essential factor that needs to be managed. Credit risk is the possibility that a borrower or counter party may fail to meet its obligations in accordance with agreed terms. Credit risk, therefore, arises from the bank’s dealings with or lending to corporate, individuals and other banks or financial institutions. In general, a banking system aggregates a high number of low value deposits to fund enterprises with a smaller number of high value loans. This intermediation through a well functioning bank helps to achieve some economic benefits for the depositors, the borrowers and above all — the economy. The Bank must allocate loans effectively for achieving these broad objectives of the Economy. While identifying profitable enterprises, the Bank – in fact — identifies risks of the borrower and business in order to allow loan in the context of its risk–return profile. In other words, Banks are in the business of risk taking; as such risk management is viewed as a core function of banking. As a financial enterprise, the prime objective of UTTARA BANK LTD. Bank is to maximize stakeholders’ value (share holders, depositors, borrowers, employees and the public). The loan portfolio of the Bank is the primary source of earnings. But it may also be Bank’s greatest concern for survival and sustainable growth in an ever-changing environment. Risks that affect lending activities and their minimization. Tools and techniques of measuring risks. Asset quality, Capital adequacy and Earnings of Uttara Bank. To assess the decision undertaken by the top level management to keep the rein with the competitiveness of the market. To have a clear concept on departmentalization and the authority entrusted on different officials. Recommending some guidelines to improve the effectiveness . To acquaint with the techniques of supervision, monitoring, and recovery of various Investments (Credits). To make some suggestion in order to improvement Credit approval and monitoring process. This study aims to analyse the credit risk management of commercial Banks in context of Uttara Bank Limited. Basically this is a theoretical study. Data and information are mainly collected from secondary sources i.e. Policy Guidelines, records, manuals and publications of UTTARA BANK LTD.; printed materials of Bangladesh Bank, Text book, website etc. The collection of data was mainly concentrated on the term loan portfolio of the bank and data from different branches were colleted from different statements. The Primary data has been gathered by formal discussion with the credit officials and borrowers. Secondary data has also been collected to make the report move concrete. These data has been collected from different financial statements, annual reports/ research reports, electronic media, bank document etc. All the variables used in credit risk grading could not be feed in the model to determine the effectiveness in predicting the default risk due to limited access to the data of the bank. Due to shortage of time and inadequate information, in-depth analysis could not be done in the report. The financial system in Bangladesh embraces four categories of scheduled banks, various Co-operative Banks, Non-Bank Financial Institutions (NBFIs), Insurance Companies, Credit Rating Agencies and two stock exchanges. In Banking sector of Bangladesh in addition to the Bangladesh Bank (the Central Bank), there are 4 NCBs, 5 state owned SBs, 30 domestic PCBs, 9 FCBs and 28 NBFIs as of 31st December 2005. Figure-1 briefly presents these financial market players in an organized way. Bangladesh Bank (BB), as the central bank, has legal authority to supervise and regulate all the banks. It performs the traditional central banking roles of note issuance and of being banker to the government and banks. It formulates and implements monetary policy, manages foreign exchange reserves and supervises banks and non-bank financial institutions. Under the existing interest rate policy, which became effective in January 1990, all deposit rates are decontrolled. The market, except for exports, freely determines all lending rates. Prior to the inception of floating exchange rate regime, adjustments in exchange rates were made while keeping in view the trends of Real Effective Exchange Rate (REER) index based on a trade weighted basket of currencies of major trading partners of Bangladesh and the trends of other important internal and external sector indicators. Under the existing floating exchange rate regime (that started from 31/05/2003), the inter-bank foreign exchange market sets the exchange rates for customer transactions and inter-bank transactions based on demand-supply interplay. UTTARA BANK LTD.started its operation from 3rd August 1999. This is a scheduled private commercial bank, which was established on May 20, 1999 under Bank Companies Act 1991. In 1st July 2004 UTTARA BANK LTD. converted full pledged Islamic bank from conventional bank. At present, there are 30 branches in operation spread all over the country. Within a very short period of time, UTTARA BANK LTD. has been able to create an image for itself and has earned significant reputation in the banking sector of Bangladesh. This institution attracted the customer’s attention through its different schemes. All these efforts ultimately lead to the profit generation for the Bank. For survival and growth of any business institution profit generation is must. Like other commercial banks, UTTARA BANK LTD. has specific target for collecting as well as distributing those deposits through different Credit programs for consumers and businesses. Prudent investing by the management and constant monitoring helps the Bank to attain its target and contributes to the growth of the bank as a whole and particularly its branches. 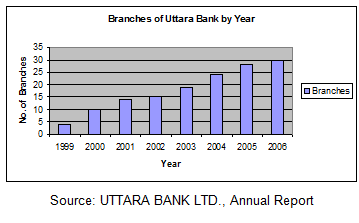 Gradual Increase of Branches, UTTARA BANK LTD. The Bank started its Journey with an authorized capital of Taka 1000 million and a paid up capital of Taka 313 millions contributed by the sponsors. The sponsor directors of the bank are well-established businessman and professionals of the country having business in and out Bangladesh. The company philosophy –“ Local Bank global network “ has been precisely the essence of the legend of the banks success. 2.4 Mission Statement Of UTTARA BANK LTD.
“To assist in bringing high quality service to our customers and to participate in the growth and expansion of our national economy. To set high standards of integrity and bring total satisfaction to our customers, shareholders and employees. The company believes that communication with, and feedback from, its clients help it achieve its goal of providing world-class products and services. UTTARA BANK LTD. regularly conducts client satisfaction surveys and make immediate accommodations and adjustments where needed. It also constantly monitors its standards, and strives to meet clients’ requirements. Organizational set-up of Credit division, Head Office is given below. All activity Credit division, Head Office under control of the Deputy Managing Director (DMD)-1 of the Bank. shipping guarantee, export bill collection services to its valued clients. UTTARA BANK LTD. Bank’s one of the strongest international banking arms, helping to serve their clients through its global network. UTTARA BANK LTD. Bank corporate banking arm provides a range of products and services that address the financing needs and transaction structuring requirements of large and mid-sized corporate customers. Services provided include loan syndication and asset sales, corporate advisory, trade finance, and working capital and term financing. Working closely with the Bank’s trading professionals; Corporate Banking also provides a range of foreign exchange, interest rate management and risk management products. The Private Bank at UTTARA BANK LTD. Bank meets client needs with a line of discretionary portfolio management, custodial services, foreign exchange, deposit services, credit facilities, and personal banking services. Retail Banking at UTTARA BANK LTD. Bank provides all types of clients with typical banking services such as, savings accounts, current accounts, call and short-term deposit accounts, fixed deposit accounts, time deposits, foreign currency accounts and secure locker services. The senior most officer of that any branch/division supervises the Management of any branch/division of UTTARA BANK LTD.. He is called as Manager or division in Charge. The division in Charge of Credit division, Head Office is DMD-1. Under the division in Charge, there is a post of sub division in charge in Credit division, Head Office; this post is held by an EVP. There is three PO and two SO and six officers working in the division. All the other officers working in this division are officer, AO or JO.